Here's a lovely gift for grandparents and grandchildren alike! 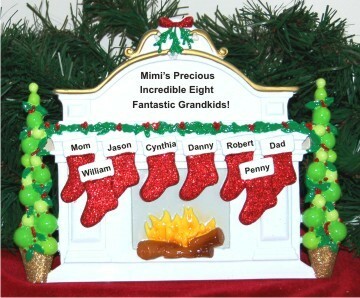 The festively adorned Christmas mantel: Our 8 grandkids personalized Christmas ornament will brighten homes when it is displayed in a favorite location - kitchen table, fireplace mantel or a book shelf. These grandparents ornaments personalized for added pleasure are hand painted with the details you provide. Share a memorable gift this year that will be appreciated in years ahead, the Christmas mantel and stockings 8 grandkids tabletop personalized ornament in beautiful seasonal detail.